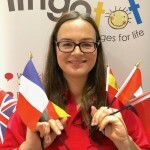 Slough Lingotot Centre | French and Spanish classes for kids. MFL PPA cover. My name is Miriam and I am a mum to two boys (5 and 3 years old). I am a native Spanish speaker and I have always wanted to share my love of Spanish language and culture with others. Studies show that learning a foreign language at an early age has many benefits for children and the younger the learner the better they are at mimicking new sounds and adopting pronunciation. Lingotot classes are fun and children and accompanying adults learn through play, songs, crafts and storytelling. I will be teaching in Slough and Windsor. Please get in touch at slough@lingotot.com to register your interest or if you have any questions.